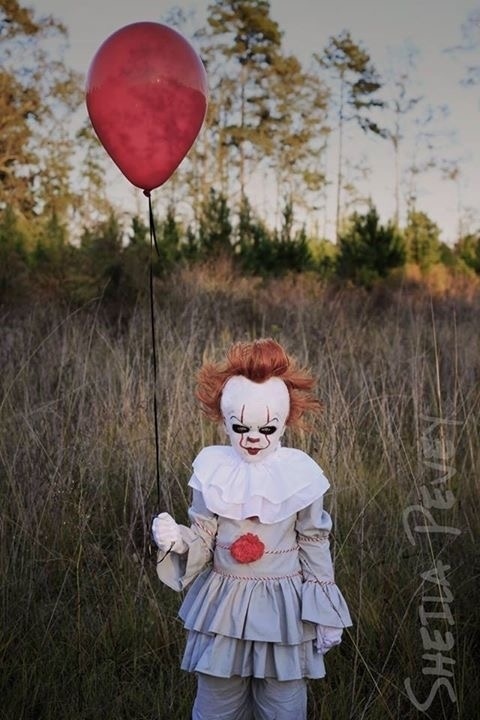 This is my 4 year old daughter, Makenna, as Pennywise! This costume was homemade by me. We were on a tight budget this year BUT since this is my favorite holiday and everyone always looks forward to my girls’ costumes, i tried not to disappoint. The outfit i made myself.. the only thing that was bought specifically for this was 4 yards of light gray fabric, 1 yard of white fabric, a gray zipper, glue sticks (for my glue gun), and red and white yarn. I used my own sewing machine and thread, did almost the whole top without instructions or a guide (dont ask me how i accomplished that because i have no clue.) I did have to watch a youtube video for the puffy sleeves at the top lol those were the toughest! There are 2 red balls on the front that i made from red yarn and hotglued on. For the red and white trim i twisted both colors of yarn together and hot glued on as well. That sums up the actual outfit.. along with white gloves i got for cheap that i had to sew smaller to fit her little hands bc all i could find were big ones. The outfit was stressful and i made LOTS of mistakes and sewed things on backwards, had to rip plenty of seams out, and the outfit is far from perfect. But it worked! I spent days on that thing. As for the hardest part... her head. (This is the reason she was only “IT” on Halloween night and not for the rest of the festivities during the weekend.) I only wanted to glue all this to her head one time! It was not a mask!. I put her hair in a ponytail and used a mesh wig cap to keep her hair in place. Then the bald cap... i cut it to fit her face and started using spirit gum adhesive to try and glue it around her forehead and ears which for some reason didnt work i’m not sure if its the material of the cap or what. So i ended up using liquid latex to glue everything. That worked out anyways because it helped blend her forehead to the bald cap. I cant even explain how i styled that wig hair because it was my most challenging task but i did it. Using some really good hairspray, backcombing, and blowdrying. My bathroom mirror was coated in hairspray lol oops. Then i got her dressed and did her makeup. I use all water activated paints so by the time we got to trick or treat, she hit a bad mood and cried and her eye makeup got messed up so next year i might look into a different option lol. All together it took like an hour and a half of getting ready though and she was a trooper. As always. She loves watching me do her hair and makeup so i kept her in front of the mirror to help her stay interested and still. Makenna has been posted on 2 local news facebook pages and we’re getting alot of shares! I just hope my baby wins for all the work and patience we’ve put into this costume! Maybe next year my oldest daughter will let me pick her costume too. Dont know how i keep outdoing the previous year but i’ll make it happen! !